The ISO 27001:2013 is a standard developed by ISO for information security management system for IT companies. The standard is revised in 2013 and to achieve ISO 27001:2013 certification, IT organizations must have to implement information security management system and prepare ISO 27001 documents that define implemented system. We offer online ISO 27001 Documentation Consultancy, in which we collect required information and details from clients via e-mail or other digital sources and prepare documents accordingly, by using ready-to-use ISO 27001 documents toolkit. We also provide them online training that helps them to learn ISO 27001:2013 documentation requirements, which saves their time and cost of documentation preparation. 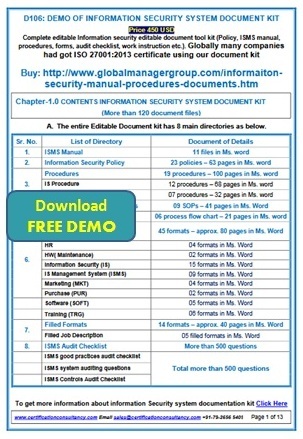 The ready-to-use ISO 27001 documents for information security management system of IT and BPO companies cover sample copy of ISMS manual drafted and endorsed to ensure effective system implementation, mandatory procedures, SOPs, process flow charts, sample formats as well as ready-to-use ISO 27001 audit checklists, etc., in editable word formats. The complete set of readymade ISO 27001 documents applies to both small and large size IT organizations. The key advantage of using such readymade ISO 27001 documents is that they save maximum time and cost in documentation process, and hence, iso 27001:2013 certification. Such documents, including ISO 27001 manual, are designed under guidance of an experienced team of ISMS auditors and ISO 27001 certification consultants; therefore, it reduces repetitive work and provides accurate documented information required for quick certification. In ISO 27001:2013 Training PPT presentation guides users to learn the requirements of information security management system and ISO 27001:2013 standard in day-to-day process. Our ISO 27001 training helps companies to review micro-level survey of the implemented system for how each requirement of the standard is implemented in the IT companies. Readymade user manual guides you on how to use training presentation and how to write quality manual and procedures for each department. Such training with ISO 27001 ppt presentation accelerates overall process and increases team's confidence towards achieving an ISO 27001 certification with proper implementation and getting the benefits of continuous improvement. Organizations looking for editable materials for iso 27001 training, iso 27001 ppt, iso 27001 presentation, and iso 27001 auditor training can purchase this product online.